If you are looking at homeschooling high school (or if you are planning to send your kids to a traditional school for high school) one of the biggest things people do not talk about is dual enrollment. Dual enrollment is when kids take classes at a local college (usually a community college) or in a local high school by certified college instructors and earn credit towards their high school diploma as well as college credits. But, but, but . . . what about Advanced Placement (AP) classes and exams? (Yes, I can hear what you’re thinking.) Dual enrollment is a big subject and this is the first part of a series to help you decide the path that best suits your high school student . Check out my top 10 homeschooling tips and tricks here! AP classes, and the subsequent AP exam, are the route most taken by students who regularly perform at an above average level. Many homeschoolers design AP classes for their children and rigorously apply the standards. Many high schools offer AP classes – some have screened admissions to the classes, some have open enrollment. Originally, AP classes were supposed to give high school students the chance to experience college level work. Showing AP classes on a transcript was supposed to show universities that a student was capable of handling advanced work. As of 2015, the College Board, the non profit who administers this test along with the SAT and PSAT makes over half of its revenues from AP tests alone. There are 39 AP subjects. There is no set standard for who should take an AP class, much less pay the $89 fee to take the test. Every year thousands of high school students take AP classes that they are not equipped to handle. For the kids that are ready for AP classes, more and more colleges refuse to give college credit for successful AP scores. Students might have the option to opt out of a pre-requisite class with a good AP exam score, but they receive no college credits for it. That leaves you, mom and dad, on the hook for them to fill in those credit hours with something else. If you have a child who loves to learn for the sake of learning and who also performs well on standardized tests, the AP route might be a good fit. If you are seeking to avoid college costs through the AP exam, you may end up disappointed depending on your child’s choice of schools. Dual enrollment might be a happy solution. In most states, high school students may take classes at a local college (community and sometimes through a private college) at no charge (aside from books) and earn actual college credit. Depending where your child might dual enroll, the credits can transfer with no problem to a state university and beyond, depending on the subject. Speaking from personal experience, here in Florida, students can enroll once they are high school juniors. They are allowed to take three classes per semester (including summer) – you pay for the books and any supplies. Any credits earned apply to high school graduation and to college in any state university. My oldest son managed nearly two full years of college by the time he graduated high school. He was interested in engineering and the local college counselor helped him set up a plan. When he started applying to schools, most would accept his science and math credits as college credits. He started an engineering degree (usually five years) and will finish after three years. When he went to orientation before starting full time at the school of his choice, he was put in with a bunch of pre-engineering students. Most had scored a 4 or 5 on their AP Calculus exam. The school would not exempt them from taking Calculus. My son, who had taken calculus at our local college, was given credit and moved on to the next course. My second and third oldest were not as focused about their futures but are both scheduled to graduate from college a full year ahead of their peers. 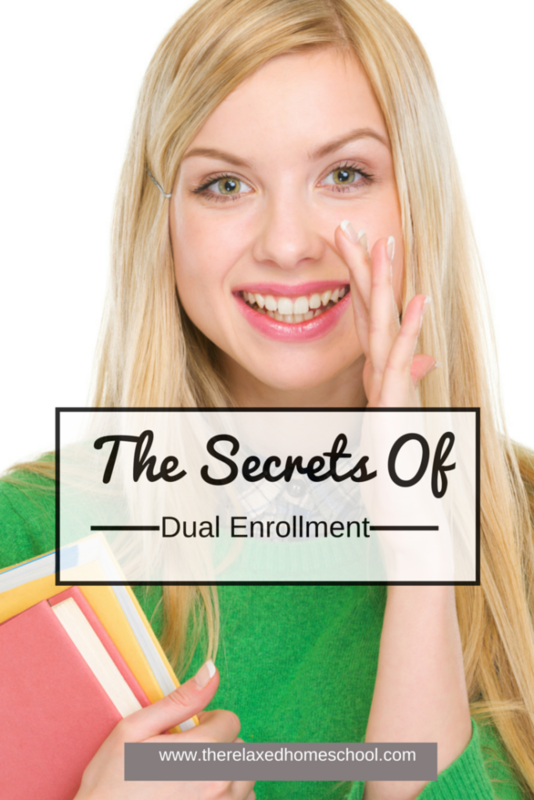 In part II we’ll look at the who, what and why’s of Dual Enrollment! In the meantime, if you have questions, ask and I’ll try to answer in the comments. In Maryland, homeschooled students have to pay a higher tuition for community college classes than public schooled students. Is this true in other states? I have a student going into 9th grade who may end up doing dual enrollment, and I wonder if I should try to get this changed before we get there! Do you have a curriculum you recommend for homeschooled high school students that is accepted by Universities?